A Christmas Journey to the Light of Christ. 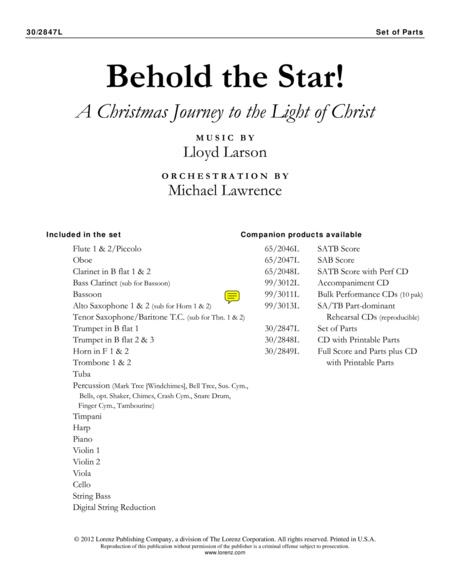 Composed by Lloyd Larson. Choral Cantatas. Christmas. Set of Parts. Lorenz Publishing Company #30/2847L. Published by Lorenz Publishing Company (LX.30-2847L). This product is the set of printed parts only for Behold the Star! and it includes parts for 2 Flutes/Piccolo, Oboe, 2 Clarinets, Bassoon (sub Bass Clarinet), 2 Horns (sub 2 Alto Saxophones), 3 Trumpets, 2 Trombones (sub 2 Tenor Saxophones/Baritone TC), Tuba, Timpani, 2 Percussion, Harp, Piano, 2 Violin, Viola, Cello, and Bass.